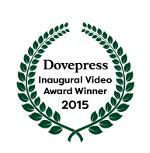 Dove Medical Press is pleased to announce the winner for their inaugural Video Abstract Award (2015). Voting was opened in early November and the video abstract that accompanied the paper “New modalities of cancer treatment for NSCLC: focus on immunotherapy” was the winner. • One free personal submission of a manuscript to any Dove Medical Press journal. Voting will be open again in November 2016, information regarding submission guidelines for video abstracts can be view here. Photo showing award winner Marianne Davies with Dove Medical Press Commercial Director (USA) Ross Ruriani. 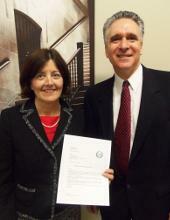 Photo courtesy of Yale University School of Nursing.